The purported images of the alleged budget iPhone just don't stop pouring in. This newest one comes from Taiwanese AppleDaily who also claims to have a shot of the iPhone 5S aluminum chassis. 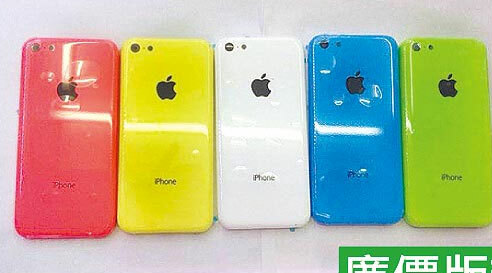 According to the latest hearsay, the budget iPhone will be available in five colors - red, yellow, white, blue and green. The bezel surrounding the display will be white instead of black for all models, as previous rumors suggested. Naturally, given the price-cutting needs of the alleged affordable iPhone, it's made entirely from pl. As for the iPhone 5S, it'll look similar to the iPhone 5 it replaces, but with updated specifications. Some of them are said to include 2GB of RAM, 12MP camera and 4G LTE-A support. The display is reportedly a 4" IGZO unit with the resolution remaining unchanged at 1136 x 640 pixels, resulting in a pixel density of 326ppi. Apple is rumored to keep the CPU of the iPhone 5S the same, but will upgrade the graphics from a triple-core PowerVR SGX 554MP3 GPU to a quad-core variant of the same graphics chips. Some crazy rumors that'll need you to have salt around include a fingerprint sensor technology for unlocking the phone and verifying NFC payments as well as a LED light on the Home button that'll blink when the phone is unlocked. The expected price of budget iPhone is $349, $449 and $549 for the 16GB, 32GB and 64GB variants, respectively. Apple should announce the 2013 iPhone lineup in September, so we'll know for sure in about two months. It has to look toyish to match the new iOS 7. Actually, Apple shares have been going up.